Storm sails are required by many organizations for ocean racing and (Storm Jib for Furlers) advisable any time you go offshore with the risk of heavy weather. Reduced center of effort means less heeling and weather helm even in extreme conditions. 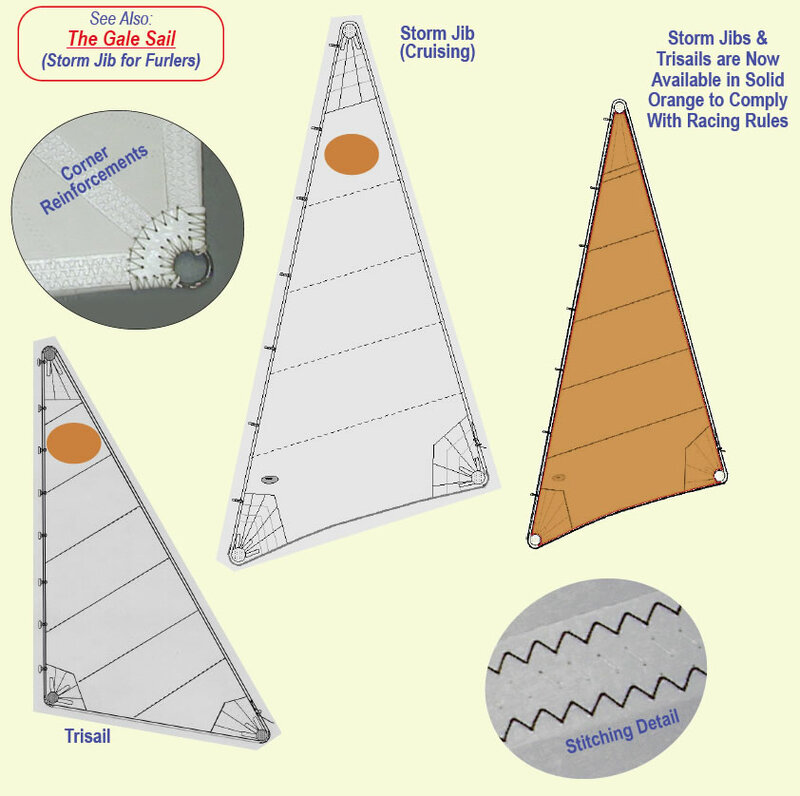 Storm sails are used for active sailing in storm conditions or heaving-to. All PRO/STOCK storm sails are built to Offshore Specifications with triple stitching, webbing reinforcements, extra heavy corner patches with leather and leech lines. High visibility orange head patches are available on the cruising version or solid orange sails to comply with race rules. *Size recommendations below are for medium displacement boats. Heavy displacement boats should go one size up. We stock storm jibs with hanks or #6 luff tape with ORC required grommets (other size luff tape is available by special order at no extra charge). Special sizes may also be custom ordered. Many people order storm jibs one size larger for sailing in windy areas like the Caribbean trade winds, Hawaii or San Francisco Bay. They also serve well as a staysail if flown from an inner forestay. In stock trisails come finished with bolt rope and grommets on the luff ready to accept mast hardware. You may install your own slides or slugs or we will do it for you. Cost is $3/ft ($50 min) to attach new hardware with webbing to an in-stock sail. Or if you have the time to wait for our next production run (4-6 weeks) we'll install the luff hardware of your choice at no charge when we make the sail. Please order custom hardware by phone. Below, trisails are listed by dimensions and square footage. You may order by boat size recommendations or estimate the square footage needed by using this formula: P X E X .175 = Trisail size (in sq. ft.).